The Data Backup and Storage contact is used for providing backup services to a customer. Covers issues such as you not being responsible for loss of data between backups or virus software on the customer's system or data integrity of the backups (i.e., what happens if a corrupt database is backed up), unless you are contracted to also ensure data integrity. great. I am happy with how the program is implemented to be flexible, easy, and efficient with my needs. A huge timesaver program. Thank you." This Data Backup and Storage Contract is included in editable Word format that can be customized in Word or by using the included Wizard software. 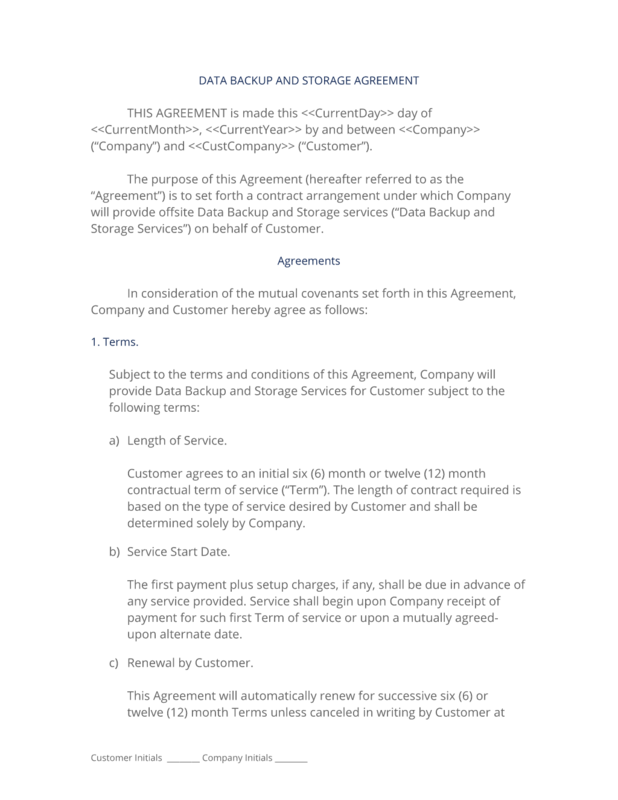 THIS AGREEMENT is made this Current Day day of Current Month, Current Year by and between Company Name ("Company") and Company Name ("Customer"). The purpose of this Agreement (hereafter referred to as the "Agreement") is to set forth a contract arrangement under which Company will provide offsite Data Backup and Storage services ("Data Backup and Storage Services") on behalf of Customer. The first payment plus setup charges, if any, shall be due in advance of any service provided. Service shall begin upon Company receipt of payment for such first Term of service or upon a mutually agreed-upon alternate date. This Agreement will automatically renew for successive six (6) or twelve (12) month Terms unless canceled in writing by Customer at least 30 days prior to the end of Term renewal date. Renewal prices are subject to change. Renewal of services by Customer indicates agreement to any contract revisions and price changes. Backup and Restoration of Data Consulting: Company consultants will make recommendations to Customer on the type(s) of backups and storage that fit the Customer's goals and objectives. Consultants will take into consideration the amount of storage space as well as the speed of the restoration and retrieval of archived data. Consultants may recommend a combination of different backup and incremental backup types to meet Customer goals and objectives. Standard Copy Backup: A standard copy backup that copies all selected files, but will not mark each file as archived or otherwise flagged as having been backed up. Standard Daily Backup: A standard daily backup that copies all selected files that have been modified on the day that the backup is performed, however, the files are not marked as archived or otherwise flagged as having been backed up. Standard Incremental Backup: A standard incremental backup that copies all of the data that has been modified since the last standard incremental backup. Archival Backup: An archival backup that copies all of the data, whether or not it has been modified since the last backup. Physical Storage of Backup Media: A physical location that serves as storage for Customer's data, data backups, and related storage media. Transportation of Backup Media: Services involved in the transporting of backup media between Customer and Company's facilities or location(s). The nature of Customer data and backups is that they are stored on impermanent physical media which are subject to degradation and technological change. Company will make every effort to continually transfer or upgrade storage devices and media in order to fulfill its obligations under this agreement. Company reserves the right to transfer and upgrade all media and backups as it sees fit unless otherwise agreed upon in the Specifications. All data backup and storage is performed on pre-determined schedules (i.e., hourly, daily, weekly), determined by the level of service desired and set forth in the Specifications. Company is not responsible for loss of data or absence of a backup between the time a backup starts and the next scheduled backup. The type of backup performed will also dictate the availability of restorable media; restore points, "snapshots," or any other data backup or storage requirement that may be needed by the Customer at any given time. End user pricing and compensation is outlined on Exhibit A, attached, and is subject to change at the sole discretion of Company. Company may impose an additional charge or a restriction of services at any time that Customer's use of the services imposes a considerable effect on Company resources or system performance. Company shall have sole discretion as to what constitutes excessive use and what activity is considered a violation of either the Company Acceptable Use Policy, or level of service that the Customer is currently using. Company is responsible for monitoring such excessive use for the account as a whole, and has no responsibility to identify a Customer's individual end user, employee, or other agent who may or may not be responsible for the excessive use of services. Proprietary information exchanged here under shall be treated as such by Customer. This information shall include, but not be limited to, the provisions of this Agreement, product and services information, and pricing. Customer further agrees to not decompose, disassemble, decode, or reverse engineer any Company program, code, or technology delivered to Customer or any portion thereof. Company makes no warranties or representations of any kind, whether expressed or implied for the service it is providing. Company also disclaims any warranty of merchantability or fitness for any particular purpose and will not be responsible for any damages that may be suffered by Customer, including loss of data resulting from delays, non-deliveries or service interruptions by any cause, or errors or omissions of Customer. Use of any information obtained by way of Company is at Customer's own risk, and Company specifically denies any responsibility for the accuracy or quality of information obtained through its services. Connection speed represents the speed of an end-to-end connection. Company does not represent guarantees of speed or availability of end-to-end connections. Company expressly limits its damages to Customer for any non-accessibility time or other down time to the pro-rata monthly charge during the system unavailability. Company storage devices make use of enterprise class antivirus software in order to protect the server and detect viruses and other malicious code. Infected files will be handled per Company policy and preferences and Company will notify Customer that an infection has been detected in the data being backed up and stored by Company. Company will not, under any circumstance, attempt to delete, repair, or otherwise remove the infection in any file. Customer assumes all responsibility for data backed up on Company storage devices and media that contain virus or malicious code. Customer is responsible for implementing Customer's own internal policies and procedures for opening potentially dangerous attachments, and is encouraged to install antivirus software on all access points or computers using Company Data Backup and Storage Services. Customer assumes all responsibility for the integrity and the suitability of the data that is to be restored. Specific requirements for testing the suitability of any data that is to be restored, schedules for such testing, and scenarios under which the retrieval and restoration of data and backup files will occur shall be outlined in the Specifications. Customer may not assign or transfer this Agreement, in whole or in part without the prior written consent of Company. In the event that Customer contemplates whole or partial sale of its business, ownership change, or change in jurisdiction, Customer shall notify Company by mail, facsimile, or email no less than 60 days prior to the effective date of the event. Company may terminate this Agreement at its sole discretion upon the occurrence of one or more of the following events: 1) failure to comply with any provisions of this Agreement or the "Acceptable Use Policy" upon receipt of written notice from Company of said failure, 2) appointment of receiver or upon the filing of any application by Customer seeking relief from creditors, 3) upon mutual agreement in writing of Company and Customer. Upon account deactivation, termination, or deletion, all files and data stored on Company servers will be immediately deleted immediately. Company has no obligation or responsibility to store Customer's data after Customer's account has been deactivated or terminated. If any provision of this Agreement is held to be unenforceable, the enforceability of the remaining provisions shall in no way be affected or impaired thereby. This Agreement shall be governed by and construed in accordance with the laws of the State. Exclusive jurisdiction and venue shall be in the County County, State Superior Court. The complete Data Backup and Storage Contract - with the actual formatting and layout - is available in this Contract Pack.